Fields starting with "*" Denote a required field and must be filled to successfully submit our form. 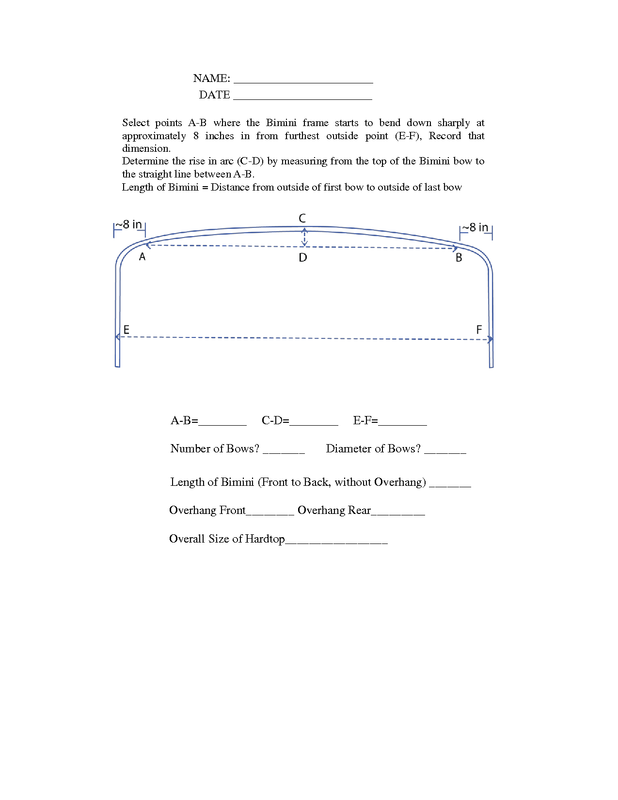 For a set of instructions on how to measure your top; VIEW or Download PDF VERSION Measuring Sheet. 2Let us know where you found out about our hardtops. 3Due to the large variety and customizability of boat tops we can not at this time determine size of a bimini/welded framework based on the size, make, and model of your boat. We ask that you measure the frame or give a rough estimate for a quote. Having boat information helps us to judge the size and build obstacles we may encounter. 4If you would like a quote but do not have complete measurements please estimate, to the nearest foot, the width and length of your framework or desired top size. Then enter your dimensions here. 5If you have an existing canvas bimini, fiberglass top, welded frame, t-top, or just 2x4''s holding up a tarp check this box to let us know. If you desire more than one hardtop, please email us at info@hardtotop.com with your dimensions, or call us directly at 1-888-306-6136. If youd like to attach photographs or documents to your quote complete our form then please email the attachments to us directly at info@hardtotop.com citing the name used in the quote.